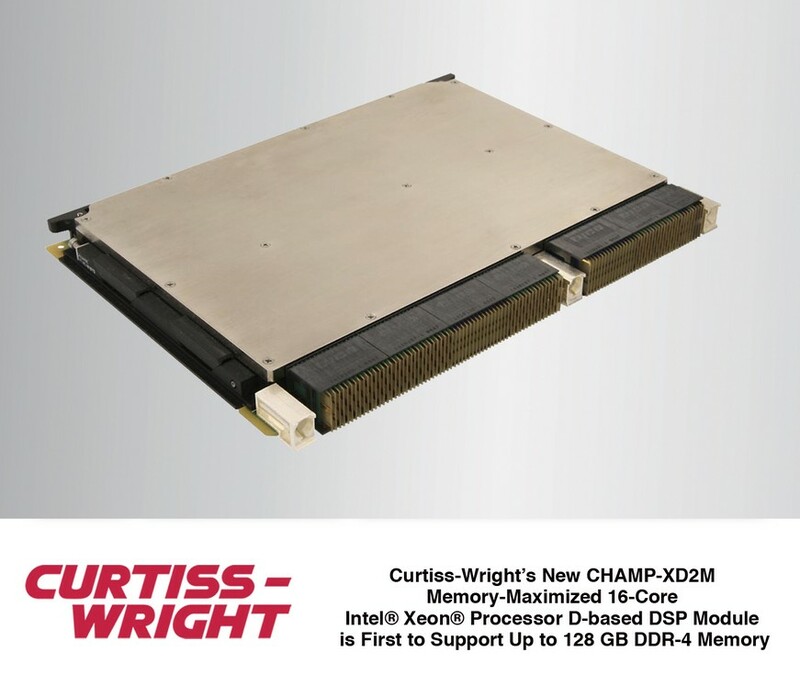 ASHBURN, Va. – TBD – Curtiss-Wright’s Defense Solutions division today announced that it has introduced the CHAMP-XD2M, a memory-maximized derivative of its popular multicore Intel Xeon processor D-1500-based CHAMP-XD2 DSP module. The new rugged 6U OpenVPX™ board is ideal for memory-bound applications that require the maximum amount of memory per VPX slot as possible. While the original CHAMP-XD2, with its dual Intel Xeon Processor D devices was designed specifically to address demanding compute-bound applications, the single processor CHAMP-XD2M board is uniquely able to keep up with the “firehose” of incoming data from memory intensive applications such as sensor fusion. The board expands Curtiss-Wright’s supercomputer-class DSP module family with the industry’s first 16-core Xeon Processor D based COTS module to support up to 128 Gbytes (GB) of onboard DDR-4 memory, the maximum supportable by the processor. The CHAMP-XD2M also features a Xilinx® UltraScale™ Core Function FPGA. The CHAMP-XD2M provides system designers with an ideal set of building blocks to deliver maximum compute power and system memory per VPX slot. While processing in-coming sensor data, ISR systems often shift between requiring more processing capability or more memory, depending on which stage of the processing pipeline the data resides in. The CHAMP-XD2M eliminates ISR data bottlenecks in memory-bound applications. It combines the maximum amount of memory with the highest core-count Xeon Processor D device. The rugged module is designed for the most demanding deployed HPEC systems, to support applications such as next-generation Radar, EW and C4ISR applications and SAR, cognitive EW, and airborne cloud computing. It is ideal for use in applications that require the realtime processing of vast quantities of sensor data, such as that generated by emitters, SAR, Camera, and EO/IR imagery. The CHAMP-XD2M has already been selected for use in a sensor fusion system onboard a major High Altitude Long Endurance (HALE) unmanned aerial system (UAS). Curtiss-Wright’s family of 6U and 3U CHAMP-XDx open architecture COTS modules feature high-speed DDR4 memory, high bandwidth PCIe Gen 3 data paths on the expansion plane. They also support a combination of 1 Gigabit and 10 Gigabit Ethernet (GbE) interfaces, as well as support for 40 GbE and InfiniBand. 3U and 6U CHAMP-XDx modules increase application scalability and transportability because they support software compatibility, share the same architected memory and compute nodes, and provide similar I/O. This enables system designers to cost-effectively re-use solutions across multiple platforms with differing size, weight, power and cost (SWaP-C) constraints and program requirements. To maximize system configuration flexibility, the modules also feature XMC card expansion. To ensure the protection of critical technology and data, the CHAMP-XD2M supports Curtiss-Wright’s TrustedCOTS™ hardware and software security features that enable customers to implement protection plans quickly and economically. The single-processor CHAMP-XD2M brings the performance of independent 16-core Intel Xeon Processor D to a single 6U chassis slot. It supports either 40 GbE or InfiniBand on the Data Plane in addition to its 1 GbE and 10 GbE interfaces on the Control Plane. The new DSP module also supports Curtiss-Wright’s recently introduced OpenHPEC Accelerator Suite™ of best-in-class software development tools. OpenHPEC Accelerator Suite speeds, simplifies, and lowers the cost of developing HPEC systems through the use of non-proprietary open standard based software. The OpenHPEC Accelerator Suite brings the benefits of open standard HPC software to the COTS market to effectively remove the risk from developing large scale embedded computer clusters. It includes a broad and comprehensive array of open standard drivers, middleware and libraries. It also includes proven solutions for cluster-wide debugging tools, performance profiling, performance reports, data flow performance analysis, and built-in-test tools, all of which have already been developed and qualified for commercial HPC use.